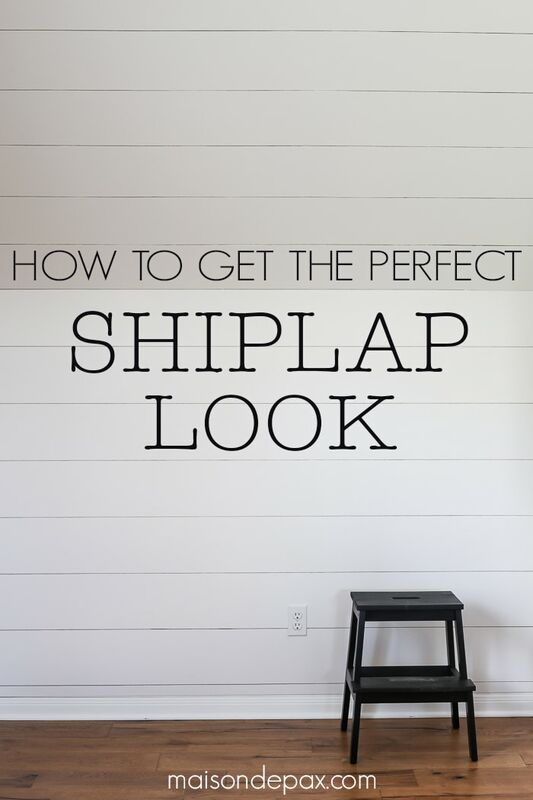 Love the look of shiplap? 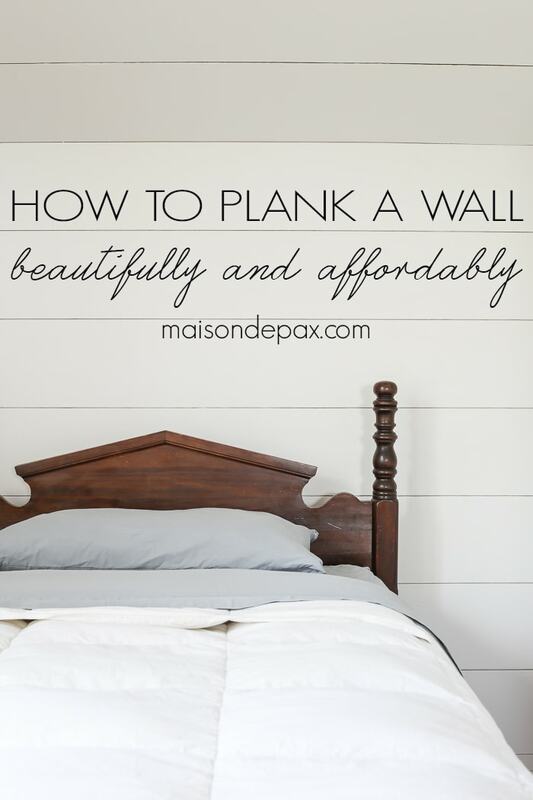 Learn how to plank a wall beautifully and affordably. I admit that when I first shared this new plank accent wall (my own little “diy shiplap”) in my son’s room, I thought the reveal might put off my need for sharing the tutorial for some time… Boy was I wrong! I’ve had so many requests for how to plank a wall (and a few offers to hire me to do it myself 😉 ), that I finally gave in and got to work on this tutorial. This is not shiplap. Shiplap refers to boards whose edges have a certain shape that fit together with the next board in an overlapping manner. Tongue and groove is another type of planked edges (our attic ceiling was done using this kind of planking), and it is just what it sounds like: each plank as a groove on one side and a tongue on the other which fits into the next board’s groove… and so on. This, my friends, is a fake. Made to LOOK like one of the two above. One other PSA before I continue. “Shiplap” (or not really shiplap but we love to call it that anyway) is super trendy right now. Do I love trendy? Sure. Do I think it makes sense to add trends to your home? Maybe but not necessarily. Because I want to help and encourage you to invest in your home – both physically and metaphorically – I feel like I should remind you that 30 years from now, this might just be the awful fake paneling of the 1970’s. I, for one, have never minded that paneling, as long as it was painted white. 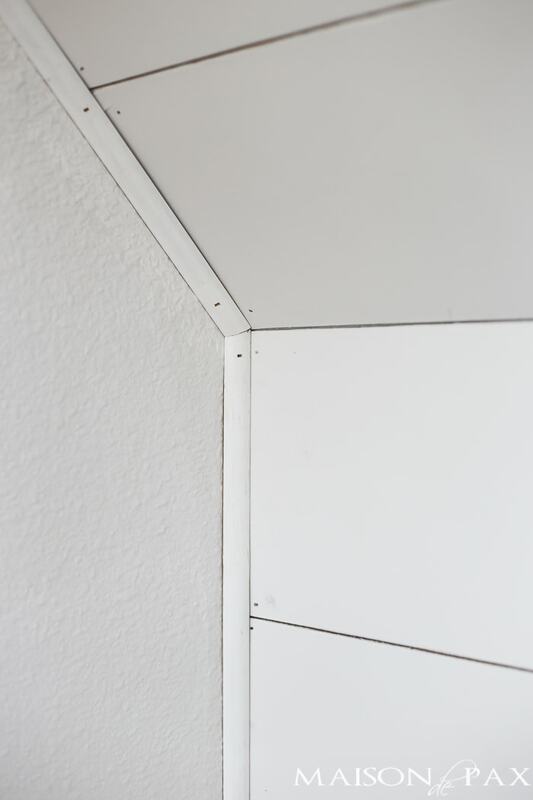 In fact, I have had some kind of paneling in every home we have owned – long before Fixer Upper was popular – I painted it all white and loved it. That said, be sure it’s something you won’t regret. Don’t go to the trouble, expense, and even damage to perfectly good drywall if you don’t think you’ll love it forever. *I’ve linked the newest versions of the tools we use (where applicable), but other brands will work, too. **Now here comes a major confession: I’m not actually sure what kind of plywood sheets we used. I read labels carefully and felt the boards, looking for the smoothest, thinnest, most “real wood” sheets I could find. I thought we chose a 1/8″ plywood that was ~$9 per 4×8′ sheet. Then my sweet hubby went to get it cut into planks for us and load them in the truck while I ordered our new kitchen cabinet doors (woohoo!). Later, while I was installing the planks and admiring how well I had chosen the material, Mr Pax said to me, “Oh yeah, apparently it was miss-marked. I think they may have been 1/4″ because I got to check out and discovered they were closer to $20 each.” And the sweet man couldn’t find the receipt either. It didn’t mess us up too bad because we were doing such a small wall, but make sure you confirm the price on your boards before you have them sliced up. Another note on choosing your planks: consider the finished look you want. We wanted clean and smooth because the rest of our house is simply not rustic. I would advise against MDF or any other fake wood materials; those tend to swell when they get wet (even painted), and it is much harder to sand out imperfections. A nice, thin (i.e. lightweight), smooth as you want plywood is going to be your best bet. And look for boards that are as straight and level as possible. UPDATE One more word of caution: I have heard from a reader that the stores do not guarantee the straightness of their cuts. The employees in our store were happy to do it for us and the cuts were just right, but please know that I can’t speak for all the stores. 1. 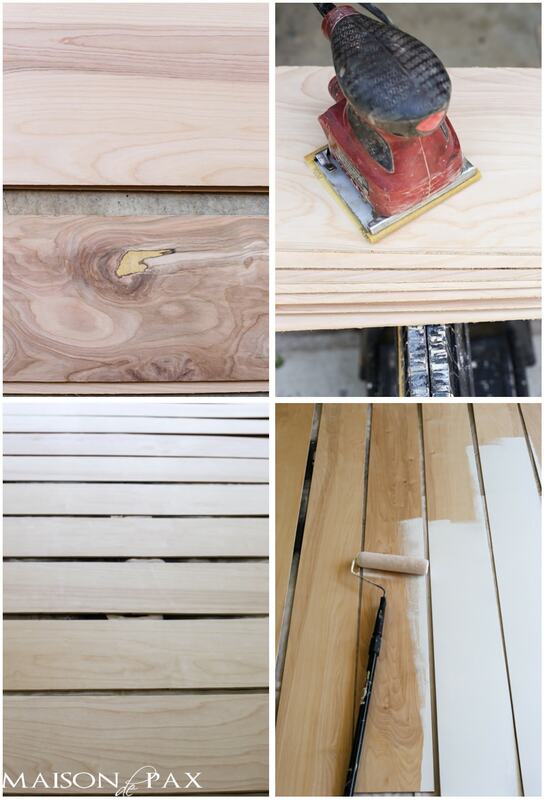 Cut your plywood into planks. If you have a table saw, go for it! If not, the folks at Home Depot are awesome. Simply tell them you want it cut into 8″ strips (or whatever width plank you would like), and they will do it for you. Remember that you will likely have one plank that is narrower than the rest due to the width of the saw blade. Just use that one for your bottom row. 2. Choose the “better” side of each plank. If you’re going for a rustic look with your DIY shiplap, it probably doesn’t matter which side you use… But we wanted to avoid imperfections like you see above. You also might consider the ramifications if your boards are not completely flat (which is likely with thin plywood like this). Since our wall was only 7′ wide, we used full length boards and did not have any seams. But if you have seams that don’t fall on studs, a board that bows outward (away from the wall) may have trouble attaching well. So try to choose the side that allows the bowed boards to curve toward the wall. 3. Sand all along the edges of your front side. Now that your shiplap boards are stacked with your “better” side out, use your palm sander to sand out all those splinters and imperfections from the saw. I did not sand the face of our boards much because they seemed very smooth already, but if you get a particularly rough board, you might want to sand that, too. 4. 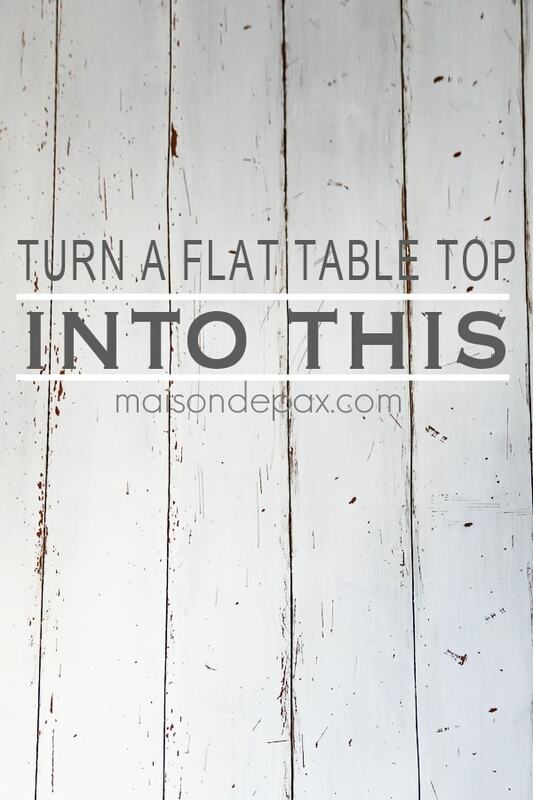 Tape a drop cloth to a large flat surface and lay your planks down with the sanded side UP. 5. 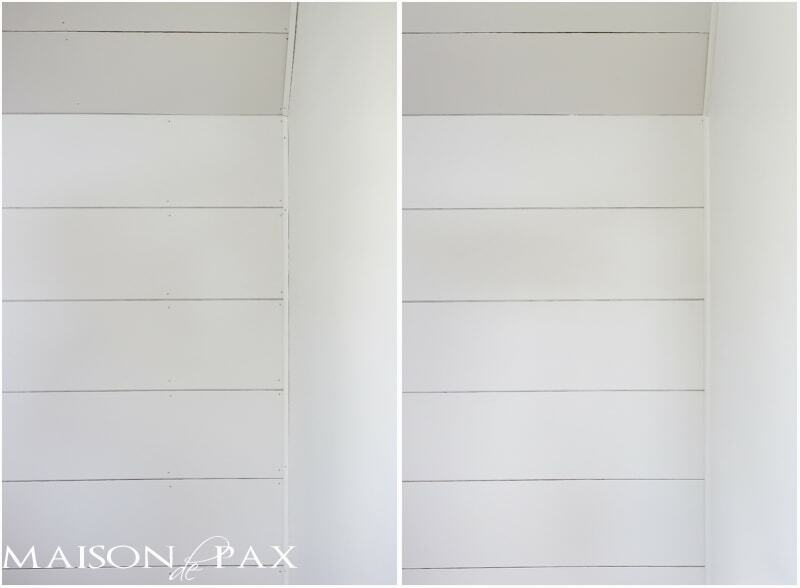 Prime and paint your shiplap boards. If you have a high quality paint + primer, you can skip the primer. I used Behr Marquee Cameo White in eggshell (the same one I used in my master bedroom), and WOW. One coat was almost enough… even on the raw plywood! I worked with Behr in the past (and this paint was leftover from that collaboration), but this is completely unsponsored admiration. 🙂 I did a second coat just to be sure to get full coverage, but it was almost unnecessary. TIP: Most regular broom handles will attach onto a basic roller. But doing that, you can roll the paint on in no time. 6. 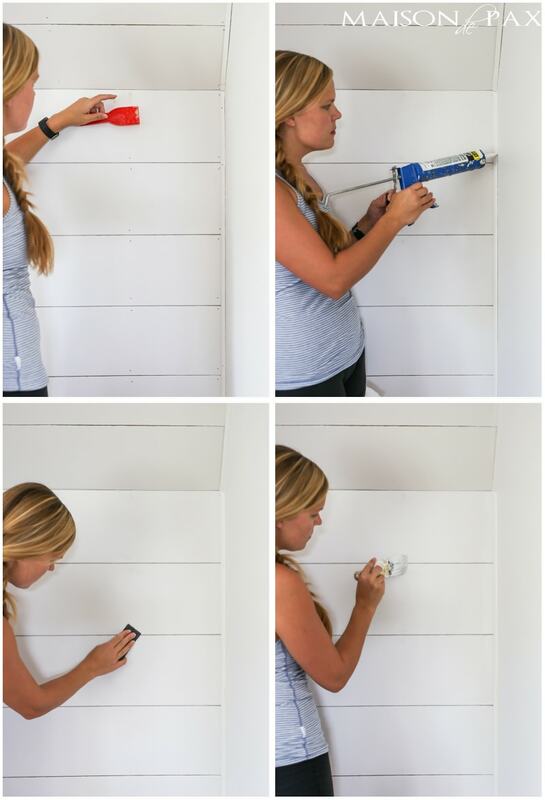 Prep your wall: mark all your studs and remove electrical covers. We used a pencil to mark studs, and it is too faint to see on the full wall pictures, but you can see it in the image below: mark both sides of each stud clearly. 7. Practice with your nail gun. 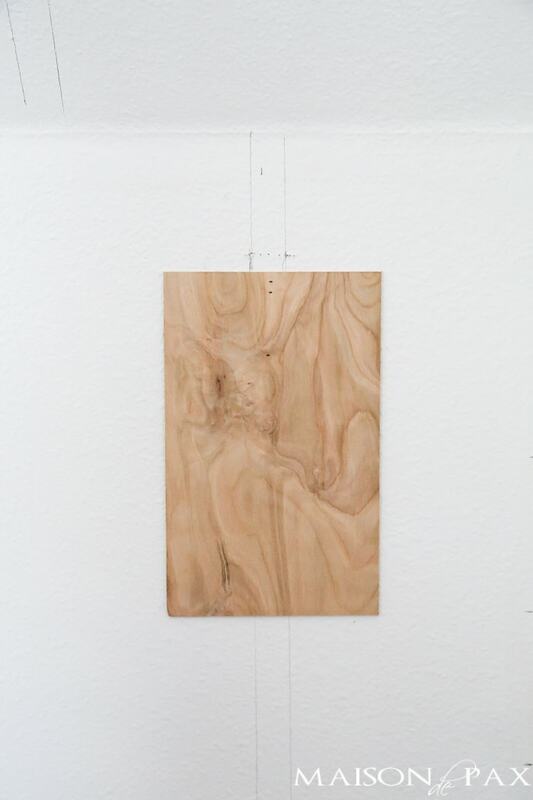 Especially with thin plywood, it is easy to overshoot the board and send the finishing nail into the wall. Use a little scrap and be sure you have your pressure on your air compressor set to the right level. 8. Using a long level, hang your first plank AT THE TOP of your wall. You may not be able to tell in my photos, but this is actually a very short wall with an angled ceiling. We opted to plank the angled ceiling portion, too, but we wanted to be sure we had a full width plank above and below the angle because it’s pretty close to eye level. For a normal wall, start at the ceiling. Put two nails (one near the top of the plank and one near the bottom) in EACH stud. If your wall is wider than 8′, use your miter saw to cut your second plank the correct length to finish the wall. Then use the leftover piece from that plank to start your second row; this will stagger your seams. 9. Using two nickels as spacers (one at each end), start your second row… and continue on down the wall. 10. When you get to an outlet, measure and mark the hole on your board. 11. Using your jigsaw, cut the holes around the outlets. 12. Rip your final plank. When you get to the bottom of the wall, measure the width of the last section (and don’t forget to account for your nickel spacers). Using a table saw (if you have one) or a circular saw with a guide, cut your final plank(s) to the proper width. Note: our baseboards are very thick and have a flat top, so it was an easy choice to leave our baseboards in place… but if your baseboard is thinner than your planks or has a curved top, you may want to remove them and plank all the way to the floor before reinstalling them. Entirely your choice. 13. Use your quarter round to cover the ends of the planks. This is actually optional, but as I mentioned, we wanted a pretty clean look in our home, so covering the ends made perfect sense. Some basic quarter round cut to the height of the wall does the trick. Now come the finishing touches. You must ask yourself, how rustic do I want this? Some people like the nail holes and cracks… It just didn’t go with the smooth finishes in the rest of our house, so with an extra hour of work, I was able to make it look much neater. See below the before and after. 1. Use painters putty to fill the nail holes. I just shove it in there with my finger and wipe it off. I chose to use caulk only where the quarter round met the sheetrock because I did not want to dig caulk out of the cracks between the planks. 3. Sand the places where you put putty lightly with 220 sandpaper. The primed quarter round still needs paint, and the filled nail holes need a little bit, too. And that’s it! Sit back and admire your work. Love this tutorial! My suggestion to those wanting to try this out is to gently make sure the person who rips the boards at Home Depot is precise. It can make or break the ease of a project! Also, my home leans more modern farmhouse/fixer upper and we got by with leaving the nail/staple holes. It works for us because we were afraid that with modern Ikea cabinets we might go TOO sleek. The visible holes leave a little texture and rustic charm sits in juxtaposition with the new cabinetry. 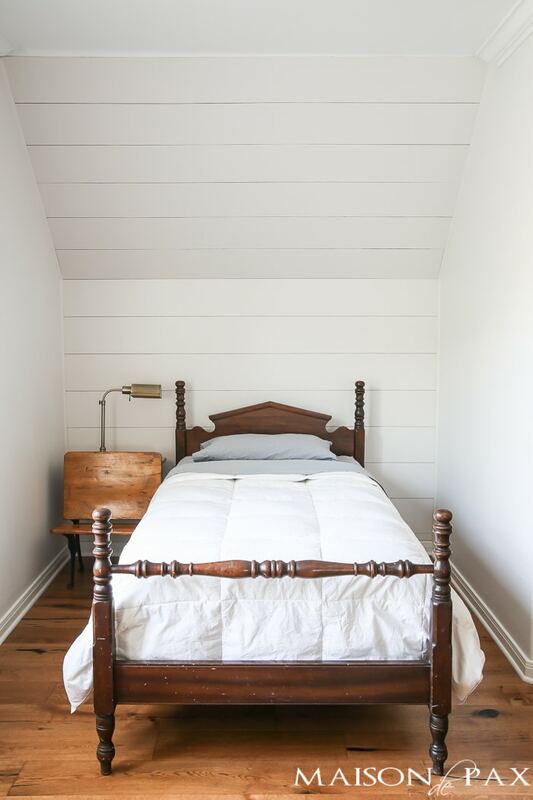 Rachel, I love the duet of your shiplap with the antique bed. Dreamy! I have never seen a nail hole that added to a project. Fill them in. Exactly the configuration of the wall I want to cover, including the angled ceiling. Thanks for the tips, they will be very helpful. So glad it was helpful, Dennis! It was refreshing to read what I’ve thought for some time–that one day this may be looked at like the fake paneling of the 70’s. I’m always happy when the style I’ve always liked becomes something I can purchase. It doesn’t always work when it isn’t trendy–I wanted white cabinets and marble countertops 16 years ago when we were redoing our kitchen. The only white cabinets we could find at the time were laminate (and we looked at everything Home Depot and Lowe’s had to offer), so I passed on those and got a dark wood (which I also like). I still wanted Carrera marble, but the stone place didn’t want to sell it to me. They told me it was awful for counters. There were no similar choices in quartz to purchase at the time; I certainly looked. Now there are lots of choices. At the time I ended up going with the lightest granite we could find, but it’s more gold. And now, my dark cabinets with gold granite are dated and people dislike them (not mine personally, but I hear a lot of homes having trouble selling because the style is outdated) because they’re not white with white/grey marble. In the end, choose what you love, because it is your house. Things can be changed (though not always easily or inexpensively) but if you sell later and people hate it, they may very well change it. It’s important that you love what you have for the long run. I love what you said, Brandy! I grew up with a white kitchen with marble countertops because it’s what my mom loved… and it was NOT in style at the time. Now, though, many people would love her kitchen. The styles do rotate through, and it’s so important not to bend towards it unless it’s something you’ve always loved or can be easily changed later. Thanks for sharing! Really nicely done tutorial. I’ve followed your blog for a few years now, and really appreciate the ideas you share. Thanks! That means so much to me, Jamie. Thank you!! Love this tutorial! Thanks for all the work putting it together. I love this! So well done, my friend! There is an extra closet in our bedroom with no doors. We have a a dresser in there with a lamp and our little early morning coffee station. I think that planking the little vaulted ceiling in there would be just perfect. Your tutorial is fantastic. We are getting ready to shiplap our wall and I was wondering, do you need to paint the edge of the plank? Thank you, Michelle! I intentionally tried to kind of paint the edges when I rolled the planks, but I admit that at certain angles you can still see some wood-color along the edges once they are installed. I honestly don’t mind it at all (and it really is VERY subtle), but if you think that’s the kind of thing that would bother you, you might want to go ahead and paint the edges before you install. You can always go back with a brush later and just get the spots that show if you want. Hope this helps! 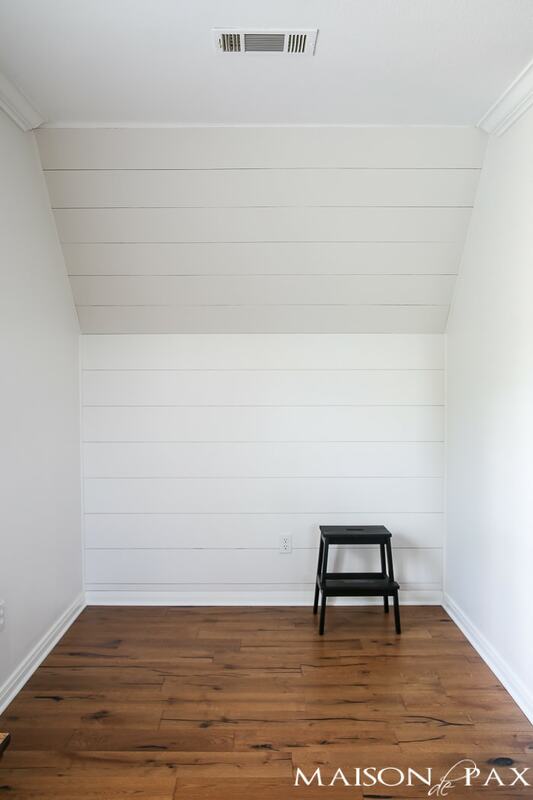 Would I need to paint the wall that is about to be shiplap white before applying the shiplap*. Since you left a nickel width? Great question, Karie. I do recommend painting the wall white if it’s not white already. Hope this helps! Thanks, Ellie! The nickel just gives it that look of old planks that don’t fit together seamlessly. If they are too close together, they look almost flat in some parts and like they should be sanded smooth in others. You can certainly play with different spacing for the planks, but the real “shiplap” type look has a little crack where the boards overlap. I hope this helps! With such thin plywood, did you have to extend your outlet box so it wasn’t sunken behind the outlet cover? I’ve done the real shiplap before, and at 3/4 inch thick, the outlet didn’t sit flush with the wall anymore. I had to put an extension box in every outlet before putting the plates back on. Just curious if 1/4 inch makes a difference. So sorry for the slow reply! I honestly can’t remember what we did and I kept forgetting to ask my husband. 😉 If our memories serve, though, I believe our screws were long enough to simply leave the boxes where they were. Yay for one less step! My husband and I just put shiplap up in our basement and we realized that ALL light switches and outlets are now sunk in. What extension boxes are you speaking of? Your help will be greatly appreciated! 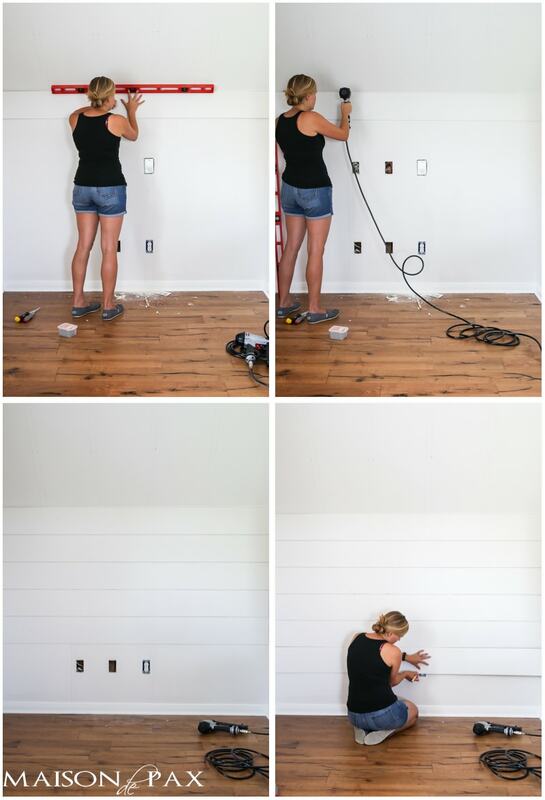 The shiplap is 3/4” thick…. We have a drop zone area by our back door where the dry wall has been ripped out. I was thinking of doing the “shiplap” look in this area. Do you think I need to dry wall first or can I just put the boards up roght on the suds? Can I ask why you suggest starting from top of wall down and not bottom up? Shouldn’t it depend on your wall combined with consideration for the visual affect in any particular room? You are ripping either way that last board, I’d rather the thin one be at floor level which will likely likely be hidden by furniture, but just wanting to understand reasoning for both starting points. Thanks. Your room looks fabulous! Thanks for putting this tutorial together. I am going to plank a wall in my family room behind the TV. You didn’t mention using an adhesive so the boards don’t warp on the wall. Would you suggest using adhesive now that your wall has been done for almost a year? Thank you so much! I’m so glad you found it helpful. We opted not to use adhesive so as not to damage the drywall behind if we ever wanted to remove it. Thankfully, ours has not had any problems with warping, but I imagine the plywood you use and how straight your wall actually is and how humid your home is could all be factors that might affect your choice. I hope this helps! The floors! They are gorgeous! Are they original to the house or did you install them? I have been trying to decide on floors for 3 years! I’m so paranoid that I’ll have ‘floor remorse’ if I choose wrong. Thank you so much! They are these floors in Butter Tint. We had carpets ripped out and the wood floors installed just before we moved in. After almost 2 years of use, I can say they still look beautiful. I hope this helps! I have a wall that is 8 feet long, and both ends wrap away from room (outside corners). Two questions: #1: Would you suggest making all of the boards 8 feet long, or mixing up sizes so they are seams? #2: How would you finish the sides (L moulding or)? Many thanks for the wonderful ‘How To’ post!! I just wandered onto your website and SOOO glad I found you!!! I love the farm house décor and shiplap. 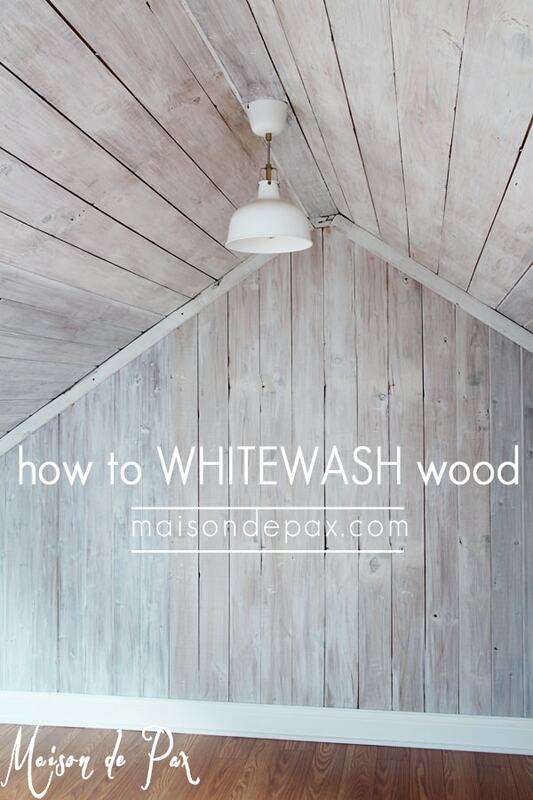 Your whitewash blogs and tips are very helpful! Maybe you could give me an idea?? Starting at the corner, there is a wall section that is about 4 ‘ wide; then there is a window. I want to ship lap that section but not sure how to “stop” at the window. Do I go as high as the window, 4 feet up, all the way up but not past the window?? I wonder if I can “whitewash” the other darker walls rather than paint but that might make the room too busy. In my bathroom I painted a medium light color and then got it “dirty” with sort of a faux effect. Actually I don’t know what I’m doing but YOU sure do!!! I will be revisiting often!!! I’m so glad you like the blog! 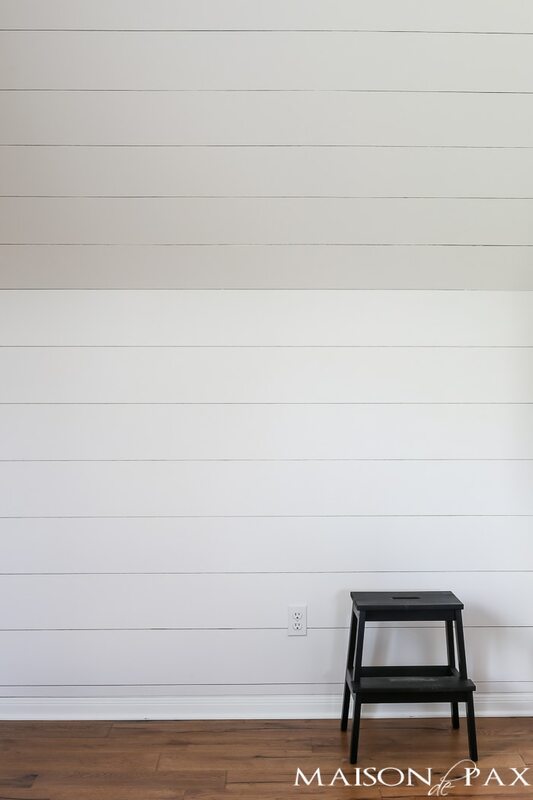 It’s tough to advise without seeing the space, but I generally think shiplap looks best on a full wall (or as an accent in an inset portion). Would it be possible to trim out the full wall with the window? That would certainly lighten the space. 🙂 And I think whitewash is best reserved for planks rather than sheetrock walls. If think if the space needs lightening then you’ll want to paint it all. Hope I didn’t just make too much work for you! 😉 Good luck! Love your post! We are going to do ship lap on our living room wall which is what you see first when you walk into our house. I am hoping it will make a nice focal point. We are debating on whether we should paint it white or the same color as the rest of the walls which is like a greige. Your thoughts? BEAUTIFUL! When painting the boards thd boards, did you also paint the edges of the board? Or just the face? With the side of the brush, yes! Hope that helps. I’ve seen post where people use underlayment for there plank wall. Use cut them to the spikes u want and then stain or paint them the color u want. Do u think u could attach them to a diffent piece of underlayment and then attach that whole sheet to ur wall? We thought that awsy it would be easier to take down if I ever wanted a change. I really enjoyed reading ur blogs! My first time! “I feel like I should remind you that 30 years from now, this might just be the awful fake paneling of the 1970’s”! I remember when we bought our first house… there were so many houses we looked at that had that awful brown paneling (usually in the basement), which now that I think about it, it’s kind of like this, except wider boards and vertical instead of horizontal! Thanks for being so thorough! I will be sharing to my Facebook business page! Deanna, thank you SO much for your comment! It truly made me smile! I’m so glad it was a helpful tutorial too! Loved this read and am currently attempting a ship lap or a “ship lap” wall. How has the wood held up since you finished it? It looks great! No issues at all. well where do I start. I have a 1979 mobile trailer and have to redo all ceilings thanks to roof leaking. we will be doing all the walls to. can I plank over existing panels. Potentially, thought I’m not super familiar with re-doing trailers. I’m sure it will look awesome! PLEASE POST AN UPDATE: Home improvement centers like Home Depot and Lowe’s will not guarantee their cut. We learned this the hard way. A new worker cut four pieces of 4′ x 8′ boards into strips. We got home to find only the outside strips we’re straight. When we took them back, store said it does not guarantee cuts and the employee should have never cut so many boards. Disappointing. I wish other readers to see this clearly within your article to avoid heartache and cost loss. Oh how heartbreaking! That hasn’t been my experience at all, but I’m so sorry to hear it happened to you. Thanks for letting me know. I love the ship lap look. My late husband was always bringing home building material home after a job was finished. He had a half dozen or so sheets of plywood stored in the barn so, I pulled them out and cut them myself with a table saw. Long story short my bedroom wall that’s about 14′ long x 8′ high looks awesome. Thank to tutorials like yours. I do not have a table saw or any other saws, so I was hoping Home Depot or Lowes would make the cuts so I could install myself. Just wanted to know if other people had this same issue. I find every Home Depot is a bit different–sometimes it depends on who is working that day. I’m sorry you didn’t have a good experience! I did planks above my fireplace. The guys at the store did NOT cut very straight, but I was able to work it out. Next time I’d go as far as to bringing a chalk line where I want cut, in hopes of straighter lines (I’d love to do my kitchen, above the counters to the ceiling) and I’d want straight lines since shelving would also be installed. Thanks for sharing, Holly! They definitely don’t guarantee clean cuts, but I am glad you are enjoying the new planks! For a truly rustic look, flat is probably best! This was a great tutorial. I found the nickels to be a pain to use for spacers. A perfect alternative is using stir sticks for quart size paint cans. I had some on hand from Home Depot. They are probably the same size as craft sticks or tongue depressors. Lay them lengthwise along the board. We used 2-3 spaced along the length as we were nailing and leveling the board. They stay in place so much better and no more chasing nickels that drop and roll across the floor. Great tips, Rita! Glad it was helpful! I tore old wallpaper off and there is a liner that is kind of cream color left over. Do you think you would see it in the cracks? Good question… Probably not. But you can always hold up two boards with the nickel between them and see if you can tell. We had already painted the walls white in there before we put up the planking, but we didn’t patch sheetrock where there were holes from a tv mount and other things, and you’d never notice those spots. I hope this helps! 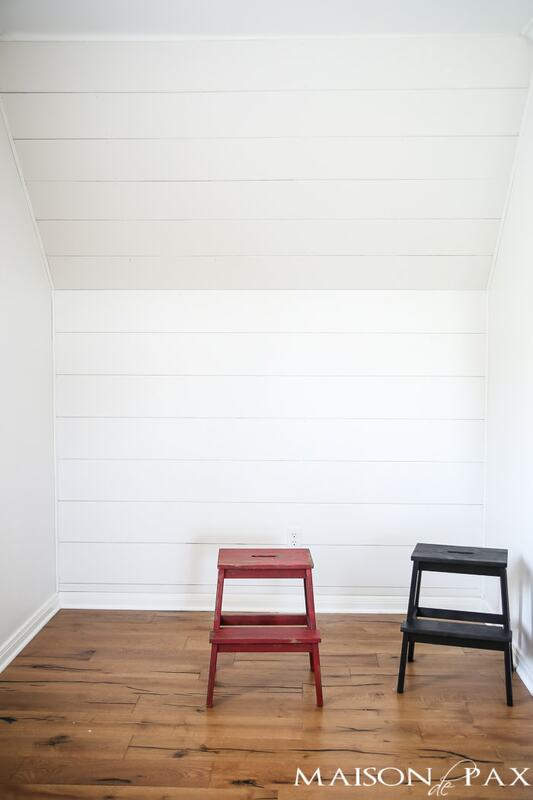 What color and brand of paint did you use on your shiplap? It’s Behr Cameo White in eggshell. Hope this helps!